A previous census of electronic prescribing (EP) systems in England showed that more than half of hospitals with EP reported more than one EP system within the same hospital. Our objectives were to describe the rationale for having multiple EP systems within a single hospital, and to explore perceptions of stakeholders about the advantages and disadvantages of multiple systems including any impact on patient safety. Hospitals were selected from previous census respondents. A decision matrix was developed to achieve a maximum variation sample, and snowball sampling used to recruit stakeholders of different professional backgrounds. We then used an a priori framework to guide and analyse semi-structured interviews. Ten participants, comprising pharmacists and doctors and a nurse, were interviewed from four hospitals. The findings suggest that use of multiple EP systems was not strategically planned. Three co-existing models of EP systems adoption in hospitals were identified: organisation-led, clinician-led and clinical network-led, which may have contributed to multiple systems use. Although there were some perceived benefits of multiple EP systems, particularly in niche specialities, many disadvantages were described. These included issues related to access, staff training, workflow, work duplication, and system interfacing. Fragmentation of documentation of the patient’s journey was a major safety concern. The complexity of EP systems’ adoption and deficiencies in IT strategic planning may have contributed to multiple EP systems use in the NHS. In the near to mid-term, multiple EP systems may remain in place in many English hospitals, which may create challenges to quality and patient safety. Adoption of health information technology (HIT) in English secondary care organisations began in the 1980s. At that point, adoption was generally ‘bottom-up’ which meant that individual hospital organisations selected which HIT system(s) to implement. In early 2000, the English government started a ‘top-down’ strategy through the national programme for IT, aiming to deliver an integrated solution nationally . The program was dismantled in 2011 due to delays in delivery and attributed costs. The English government subsequently offered financial incentives for NHS hospital organisations to adopt electronic prescribing (EP) systems and other technology . In October 2014, a ‘five-year forward view’ to revolutionise the English NHS was published . This acknowledged the drawbacks of the previous government information technology (IT) strategy and proposed a new approach with the aim of achieving interoperability between NHS systems and services. Against this background of shifting governmental IT strategy, a diverse picture of EP use has developed in NHS organisations . A previous cross-sectional census of EP systems in 165 English NHS hospital trusts revealed that 69% of 101 respondents had some form of EP in place, with more than half of these reporting multiple systems, ranging from two to six . The definition of EP in the survey was any form of EP operational in at least one ward or clinical area; this included EP modules that formed part of a wider HIT system. Several systematic reviews have examined the impact of EP or computerized physician order entry use on medication errors and patient safety [5–8]. Multiple EP system use has been reported to cause medication errors due to miscommunication between systems . However, the reasons for this phenomenon and its implications have not been fully explored. We therefore conducted a qualitative study to explore the perceptions of stakeholders about the reasons for multiple EP systems, the benefits and the potential challenges. 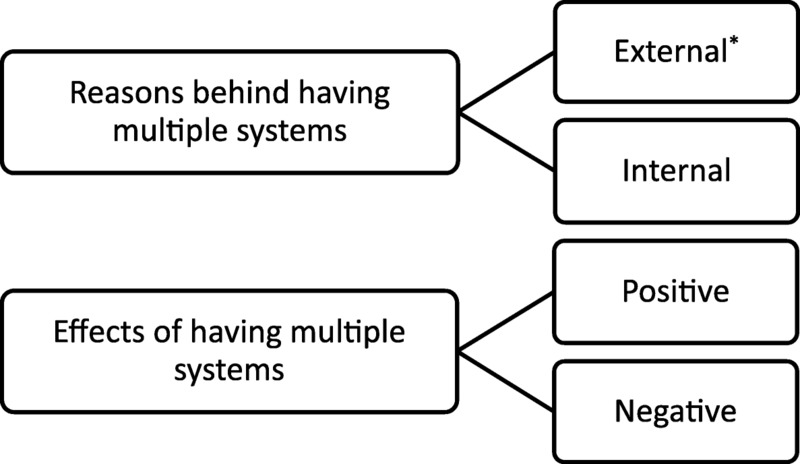 To describe the rationale for having multiple EP systems within a single hospital, and explore perceptions of stakeholders about the advantages and disadvantages of multiple systems, particularly including any impact on patient safety. Study sites were selected from the previous census respondents . The inclusion criteria were (1) hospitals that reported use of two or more EP systems and (2) consent previously given to be contacted for follow-up. We excluded outpatient EP systems as only two systems (2%) were reported in the census . A decision matrix was created for the hospitals that met these inclusion criteria with the aim of achieving a maximum variation sample based on: number of EP systems in the hospital, likelihood of overlap (the extent to which multiple systems may be used for the same patients, and/or by the same individual healthcare professionals), and characteristics of the EP systems. System characteristics were how they were developed (commercial, in-house or hybrid), type of prescribing (inpatient and/or discharge), general versus specialist systems (chemotherapy, renal, critical care, etc. ), and prescribing for specific age groups. Likelihood of systems overlap was based on a series of assumptions (Additional file 1). The process of site selection is summarised in Fig. 1. The original respondents from the selected sites, predominantly pharmacists, were invited to participate. A snowball sampling technique was then used to recruit further participants from different professional backgrounds such as nurses, doctors and IT staff, particularly aiming to recruit potential users and/ or managers of more than one EP system. An a priori framework (Fig. 2) was developed and refined following piloting to address the objectives and inform the interview guide (Additional file 2). A participant information sheet and consent form were emailed to participants prior to interview. Interviews were conducted via telephone or face to face between September 2014 and January 2015. Interviews lasted a maximum of 45 min. Interviews were audio recorded then transcribed verbatim. Framework analysis, an approach that supports systematically reducing the data and analysing it by case and by theme, was used to organise and analyse the data . Each hospital was considered to be one case. Transcribed interviews were uploaded to NVivo (version 10) and coded by researcher 1 to identify both predefined and emerging themes. Researchers 2 and 3 reviewed the coding of a sample of the transcripts. Researcher 1 reviewed all the codes and grouped them into themes. Emerging codes and themes were then refined iteratively. The resulting coding tree and each stage of refinement of the framework were reviewed by researchers 2 and 3. Data were charted in framework matrices using NVivo (version 10, QSR International); these were then used for analysis and interpretation. NHS ethics approval was not required under Health Research Authority regulations as the study involved the use of non-sensitive, anonymised interview procedures where participants were not defined as “vulnerable”. The study was approved by UCL research ethics committee. The decision matrix revealed that four hospitals were required to meet maximum variation sample. Contacts in eight hospital organisations were approached sequentially, of whom four agreed to participate (Table 1). Site A had six EP systems (all commercial), site B had three EP systems (two commercial and one in-house), site C had two EP systems (one commercial and one in-house) and site D had three EP systems (all commercial). A total of 25 participants were invited, of whom ten agreed to take part (Table 1). Interviewees from sites A and D felt that due to the nature of the EP systems they used, only those clinical staff working across different specialities, such as pharmacists, were exposed to more than one system. Therefore, only pharmacists were interviewed. Of the six IT staff approached across four sites, none agreed to take part. No alternative sites were approached due to restrictions on time and research team capacity. Figure 3 presents the final framework developed during the study. Results are next presented in the same sequence as in this expanded framework. Two main themes emerged for having multiple EP systems: different drivers and models for system adoption, and level of systems governance and strategic IT planning. Drivers of system adoption included funding mechanisms, system ownership and the stakeholders involved. Mapping these factors suggested that study hospitals had three models of adopting EP systems (Table 2). These models often ran concurrently within the same hospital, leading to multiple systems. The first was organisation-led adoption. Systems falling under this category were often used on a large scale within a hospital or organisation and were driven by local necessities and/or national drivers. The third model of EP adoption was strategic clinical network-led EP adoption. All systems that fell under this category were cancer systems. These were similar in function to clinician-led systems, but shared between multiple hospitals. The choice of system was dictated by the specific cancer networks that hospitals were linked to. Conversely, some hospitals had a strong, clearly defined IT strategy as well as integrated clinical and IT services. Interviewees reported project teams including clinical and IT staff working together, as well as strategies developed to overcome some of the negative aspects of having multiple systems, as described later. Positive as well as negative effects were reported from the patient, user, and organisational perspectives. One of the main reported advantages was providing better functionalities such as in-built safety features. Using bespoke speciality systems provided unique prescribing support in specific clinical areas as well as extra benefits such as fluid monitoring and balance chart support in ICU systems. Interviewees highlighted that the functionalities and benefits of bespoke systems may be challenging to replicate in a general prescribing system. 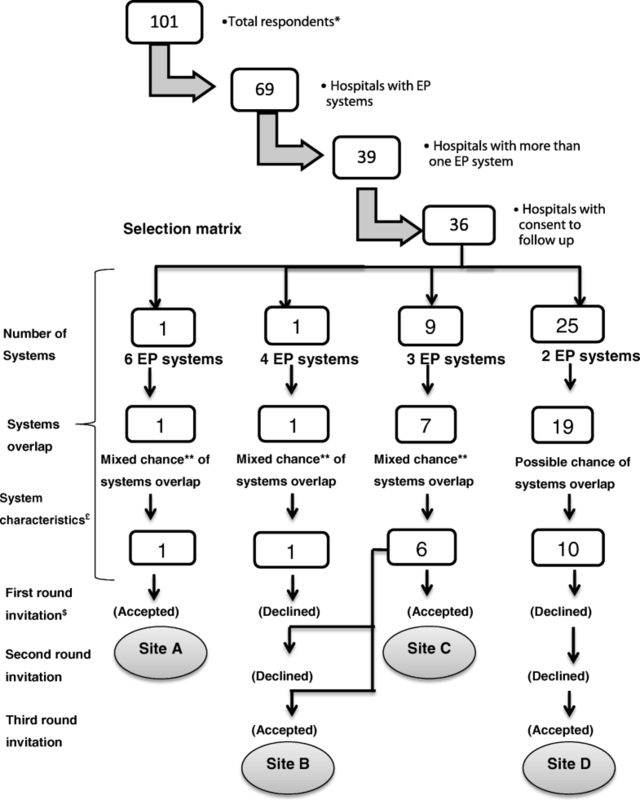 The multiple EP system approach enabled end-users to meet their clinical speciality group needs, an advantage often perceived to be unattainable when adopting integrated systems as compromises often had to be made. Furthermore, adopting multiple smaller systems allowed for an opportunity to align forces with other hospitals such as sharing cancer systems between hospitals. Such collaboration allowed spreading the load of systems management between linked hospitals as well as sharing expertise and knowledge. Interviewees felt collaboration was effective in niche clinical areas; sharing bigger (hospital-wide) systems with partners was likely to be problematic. Many perceived disadvantages of having multiple systems emerged. If individual systems were used within discrete clinical areas, these disadvantages were generally limited to individuals or staff groups working across different disciplines such as pharmacists who needed to interact with several specialist systems in their day to day practice. Conversely, negative effects of having multiple EP systems seemed more prominent if at least one of the systems was hospital-wide. Many reported difficulties related to training staff on multiple systems, especially at induction and if face-to-face training was involved. This was due to the large numbers of staff trained on various systems. Although e-learning was sometimes used, there was some resistance to it from staff who preferred to learn ‘on the job’. Customised training packages had to be developed depending on user role and access limits within the system. Interviewees reported that staff had to learn a lot about each system in a relatively short time making it difficult for staff to retain much from training. There were challenges related to training on systems managed by other hospitals such as cancer systems, as often staff had to travel to other organisations for training. Since some staff used systems sporadically, they could lose access because passwords expired or were forgotten, but more critically they felt less competent using the systems. Such issues were particularly problematic during out-of-hours and weekend coverage. Senior clinicians were less exposed to some systems and likely to delegate medication orders to junior staff. Locum staff were also affected by access and competence issues. Interviewees mentioned practices such as sharing passwords with locum staff and shifting IT related tasks to substantive staff if locums were unable to handle multiple systems. People changed some of their workflow to accommodate multiple system use. It seemed that workflow changes were more problematic at the start but then staff adapted to the new ways of working. ‘People have had to change their way of working. So you might do something in a particular order but actually now that we’ve got [multiple] systems in place you might have to do it in a different order or you might have to approach your tasks in a slightly different way. So, where possible we have tried to outline ways to do that but what you find is that users actually find their own way to do it. Although rare, workflow issues were more serious when data for the same patient were spread between two electronic systems. Staff had to log in to two different systems and locate the same patient’s records to prescribe, which was not only cumbersome but also risky as this may introduce errors. Multiple systems could result in increased work volume due to duplication. This was at a patient level, such as entry of patient data in different systems, as well as system level tasks such as maintaining drug catalogues. ‘…then making sure that the right people have got the passwords at the right time to be able to get into the system. You’ve got to make sure that you have got enough equipment available for everybody and that all the programs work on the same equipment, so that you are able to do everything from the one terminal if you need to. All interviewees reported that attempting to interface systems was difficult. A possible explanation given by some of the interviewees was the complexities of some systems or the differences in the coding within each system. Therefore, what in principle seemed a straight forward process was actually far more complicated. In some instances, systems were not completely paperless as supplementary paper-based records were also required. Therefore, healthcare professionals were faced by a mixture of paper charts and data spread across multiple EP systems. In-built safety features of systems sometimes introduced risks, especially when healthcare professionals were accustomed to a certain feature that was available in some systems but not in others. Staff developed various strategies and workarounds to reduce the disadvantages of multiple systems use, improve user experience, and improve patient safety. Strategies and formal workarounds were usually reported by hospitals that had integrated clinical and IT services. For example, in site C, both EP systems were linked to the patient administration system. Staff created a one-way allergy data feed from their main EP system to their chemotherapy system. However, they reported that setting up this interface had been complex. ‘Dummy prescriptions’, i.e. flags alerting healthcare professionals to other prescriptions existing on paper and/or other electronic systems, were another example of a workaround. All hospitals were also exploring the introduction of a ‘single sign on’ to alleviate password burden of their staff and improve user experience. Managing users’ expectations about systems linkage was another emergent theme. Achieving comprehensive linkage between EP systems was perceived to be challenging as interviewees acknowledged the difficulties of interfacing multiple systems. Interviewees highlighted staff frustrations due to lack of integration between systems, particularly as their expectations were influenced by their standard of IT use in day-to-day life. Interviewees raised some issues around EP systems’ capabilities. It was suggested that advances in HIT were not keeping up with the rapid changes of healthcare. Therefore, some systems were not able to support management of patients with complex clinical requirements. Interviewees reported lack of sufficient expertise to manage EP systems within the NHS. While IT departments provided technical support for EP systems, clinical input was provided by end-users. The separation between technical and clinical skills may have hindered appropriate system management. Interviewees highlighted the need for people with both clinical and IT knowledge. To our knowledge, this is the first qualitative study to explore the perceptions of stakeholders about the reasons, benefits and challenges around use of multiple EP systems in the context of UK secondary care. The present study revealed that adopting multiple EP systems in NHS hospitals was generally not strategically planned. EP systems’ adoption was affected by various internal and external factors. Mapping these factors revealed three co-existing models of EP system adoption and considerable variation in system governance and IT department involvement. Having multiple EP systems was perceived to have some advantages, particularly in the context of systems used in niche clinical specialities. These bespoke systems supported not only prescribing but also other clinical processes, and enabled clinical speciality groups to meet their specific needs. A previous US survey highlighted similar findings in relation to the variations in the needs and electronic health record usage between general and specialist physicians . Nevertheless, many disadvantages relating to multiple EP systems use were reported, many of which were perceived to affect patient safety. The main negative aspect we identified was fragmentation of the documentation of the patient’s journey. Our findings are consistent with literature citing safety risks associated with the lack of integration and interfacing of hospital health information technologies [13, 14]. On some occasions, healthcare professionals reported missing key information and/or not being able to obtain a full view of their patient’s record. Moreover, the same healthcare professionals sometimes dealt with electronic systems with different features, and/or paper systems, which led to reliance on or assumption of a certain level of decision support that was not borne out in practice. The findings of the present study highlight the importance of integration between clinical and IT services at both the management level and in day to day clinical practice. The study suggests that hospitals with integrated IT and clinical services developed solutions to reduce some of the negative impacts of multiple EP systems. Recruiting staff with both clinical and IT expertise is advisable as it may help bridge the gap between IT and clinical services. The use of speciality bespoke systems in niche areas, such as cancer systems, was perceived to be irreplaceable. Therefore, efforts should be directed towards interfacing such systems or the development of suitable interoperable solutions to support patient safety in the face of multiple systems. Compromising workarounds such as sharing accounts or not logging off screens have been previously reported . Our study revealed other practices used by end-users to reduce password burden, such as sequencing passwords and/or noting them on smart phones or diaries, which may compromise security. Therefore, the use of ‘single sign on’ system in hospitals with multiple IT systems should be encouraged. The findings of the present work established various drawbacks to multiple EP systems that may influence patient safety. Further work is needed to quantify and assess the clinical impact of multiple EP systems on patient safety. To eliminate unintended consequences of health IT and ensure patient safety it is vital to combine measurement of health IT safety with existing clinical risk management and safety program(s) in hospitals . The use of models or frameworks  to guide implementation and evaluation of technology while maintaining coordinated care may also help address some of the issues raised. The tension between hospital-wide and speciality systems has been previously described . Previous literature has also cited the tensions and contradictions that arise due to implementing IT in healthcare . Diversity of devices and approaches to implementing electronic patient record systems was also reported in a third of English survey respondents utilising a best of breed approach . When interviewed, respondents cited some benefits of the best-of-breed approach, but also safety concerns similar to ours . Our study is the first to specifically explore multiple EP systems use within single organisations, a phenomenon rarely described in the literature , in spite of the specific safety issues associated with EP. 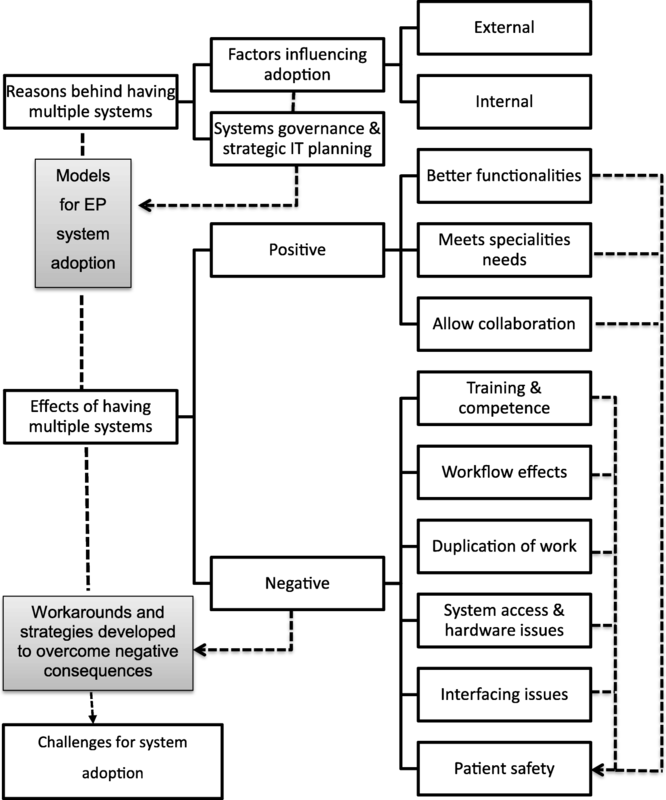 Our work exposed the three different models of EP systems adoption. Understanding these models is important for future IT strategic planning and system evaluation. While multiple EP systems use is widespread in England, the extent to which this is an issue elsewhere in unknown. The study has several limitations. First, although our interviews provided rich data, we were only able to recruit a small number of participants across all sites. Second, our sites were purposively sampled to provide maximum variation. Although care was taken in sample selection, the final sample may not adequately reflect the study population. Third, despite efforts made to include healthcare professionals of various backgrounds, most of the interviewees were pharmacists, and we were only able to recruit one participant in two of the sites. Moreover, were unable to explore issues related to IT strategy as no IT representatives agreed to take part. Therefore, it is possible that the views and opinions voiced by interviewees may not adequately reflect those of other stakeholders. Fourth, the present study was not designed to explore the full range of workarounds [21–25] resulting from multiple EP systems and it is likely that others exist. Fifth, although every effort was made by the reviewer to probe for both positive and negative aspects of multiple EP systems use, there were more negative implications cited by the interviewees. This may reflect their experience, but could also reflect a tendency to focus on the negative aspects in relation to patient safety. Finally, it was sometimes difficult to ascertain if issues reported by interviewees were related to EP use in general or were specific to multiple EP systems. However, every effort was made by the interviewer to probe as to whether effects were attributable to multiple EP systems. The complexity of EP systems adoption may have contributed to the phenomenon of multiple EP systems in NHS hospitals. Three co-existing models of EP systems adoption in hospitals with multiple EP systems were identified. As well as the perceived benefits of multiple EP systems particularly in niche clinical specialities, many disadvantages were described. Hospitals with integrated clinical and IT services described various strategies used to mitigate negative aspects of multiple systems use. In the near to mid-term future, multiple EP systems use is likely to remain in place, which creates challenges for the NHS workforce and for patient safety. We would like to thank Nick Barber for his contribution to the study. We also would like thank all participants who took part in the pilot study and research interviews. ZA was funded by the UCL School of Pharmacy Oversees Research Award (SOPORA), UCL School of Pharmacy. The Centre for Medication Safety and Service Quality is affiliated with the National Institute for Health Research (NIHR) Imperial Patient Safety Translational Research Centre and the NIHR Health Protection Research Unit in Healthcare Associated Infection and Antimicrobial Resistance at Imperial College London in partnership with Public Health England. The views expressed are those of the author(s) and not necessarily those of the NHS, the NIHR, the Department of Health and Care, or Public Health England. The funders had no role in study design; in the collection, analysis, and interpretation of data; in the writing of the report; or in the decision to submit the article for publication. The researchers are independent from the funders. The datasets generated and/or analysed during the current study are not publicly available as sharing these may breach confidentiality. All authors contributed to the conception and design of this study. ZA conducted the interviews. All authors contributed to the analysis and interpretation of data, drafting the article, and final approval of the version to be submitted. All authors read and approved the final manuscript. NHS ethics approval was not required under Health Research Authority regulations as the study involved the use of non-sensitive, anonymised interview procedures where participants were not defined as “vulnerable”. The study was approved by UCL research ethics committee. All interviewees consented to participate in this study. Verbal consents were obtained when telephone interviews were conducted and this procedure was approved by the ethics committee. All interviewees consented to include any anonymised quotes in any publications. NHS England. Safer hospitals, safer wards: achieving an integrated digital care record: NHS England; 2013. Available: https://www.rcslt.org/news/docs/safer_hospitals_safer_wards. Accessed May 2015. HIMSS analytics. The continuity of care maturity model. https://www.himssanalytics.org/ccmm. Accessed 5 Oct 2018. Wentzer H, Bygholm A. Attending unintended transformations of health care infrastructure. Int J Integr Care. 2007;7(4). https://doi.org/10.5334/ijic.218.